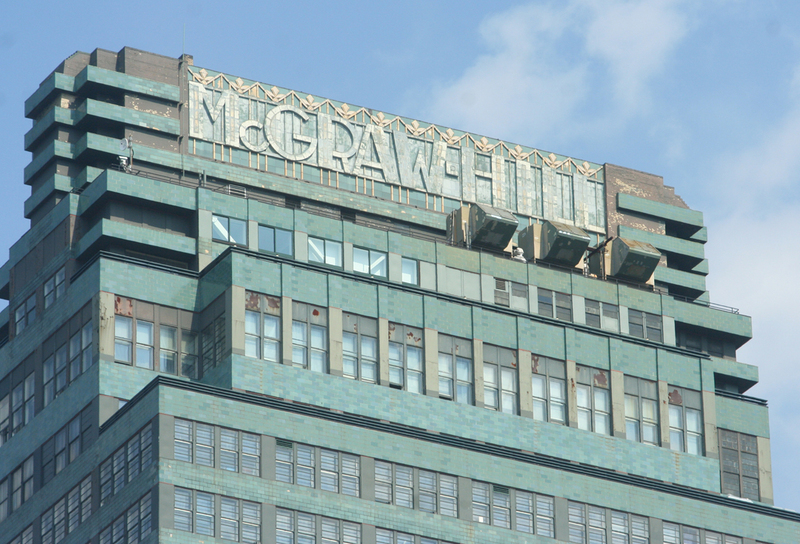 Teaming with full service architectural design firm, Cosmo Veneziale, ARCHITECT, MARTOS will be providing ongoing structural engineering services for the restoration and structural modifications of the historic, 33-story, steel and concrete framed McGraw Hill building. The restorations include repairs to steel elements uncovered during the course of façade restorations, anchorage of building cladding and appurtenances. Modifications to the structure may include but is not limited to, the installation of permanent scaffolding outriggers, verification and reinforcing of existing framing members to support new loads, and creation of new openings. Located at 330 West 42nd Street in the center of Manhattan’s Hell’s Kitchen neighborhood, the McGraw Hill Building stands 33 stories high. Completed in 1931, the building is most easily recognized by its Art Deco façade with blue-green terra cotta tiles alternating with green metal framed windows. The building was declared a National Historic Landmark in 1989 and is considered a significant example of international architecture. MARTOS is honored to be able to work on one of New York City’s most notable structures.